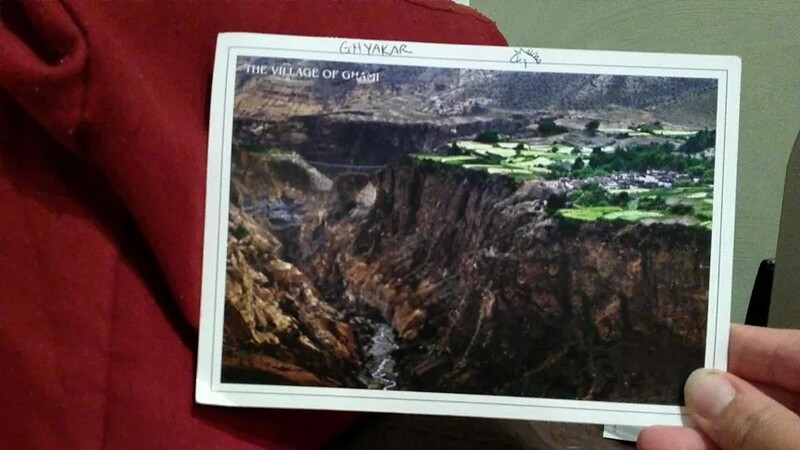 The postcards I sent from Nepal finally started arriving in Australia today (about 5 weeks after I posted them). 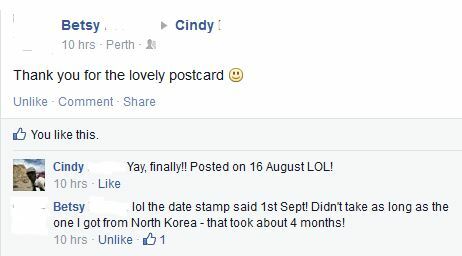 As with most things Cindy, the postcards went on adventures even before I put a stamp on them. This is their story. Throughout Nepal there are thousands of “bookshops” selling postcards, stationery, maps, panoramic posters … all featuring the spectacular Himalayas, of course. One of the great strengths of my Nepali guide was his ability to seek out the type of experiences I wanted to have. In my case, it was travelling responsibly with a community focus, and choosing to spend money in ways which would benefit locals and communities directly. At the start of our trip, he suggested that instead of buying postcards from a bookshop, I could buy them from a Tibetan Buddhist monastery we were scheduled to visit. Not every monastery sells postcards, and be honest I wasn’t sure what they would be like. But to me the point of the postcards was not about the pictures on the front, it was creating pen-and-paper connections with the people who would receive them. On arriving at Dragkar-Thegchen Ling Gonpa monastery on 14 August (one of four within the walls of Lo Manthang, the ancient walled city of Upper Mustang), we were fortunate enough to be given a special showing-around by the Principal Monk (Chhing Chhyope) Lama Tsering Tashi. His English was excellent. From what I understand he doesn’t normally do the tours (as Principal Monk he’s a very busy man! ), but the monks that would normally do it were out for the day (possibly visiting rural villages in the district). In the reception room, I found a wonderful selection of postcards featuring local landscapes and cultural traditions. 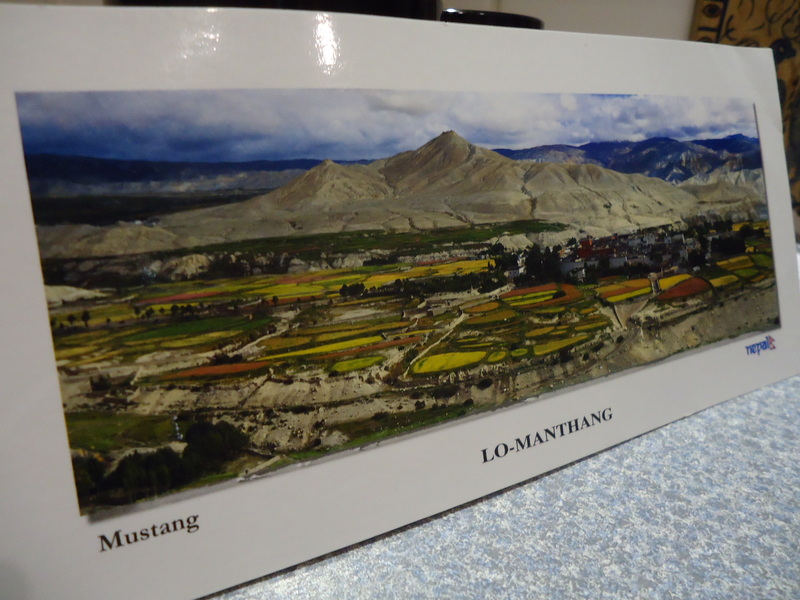 They were all local photos – 100% Upper Mustang, no pictures of Everest, Langtang or Chitwan. This was exactly what I was hoping for! The cards are printed and subsidised by the American Himalayan Foundation. 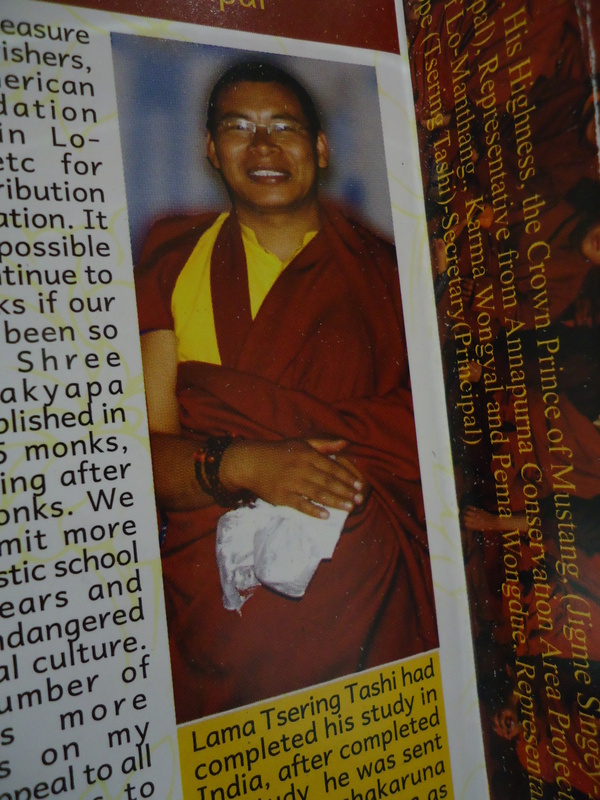 The Foundation prints the postcards cheaply for the monastery to sell as a small fundraising initiative. 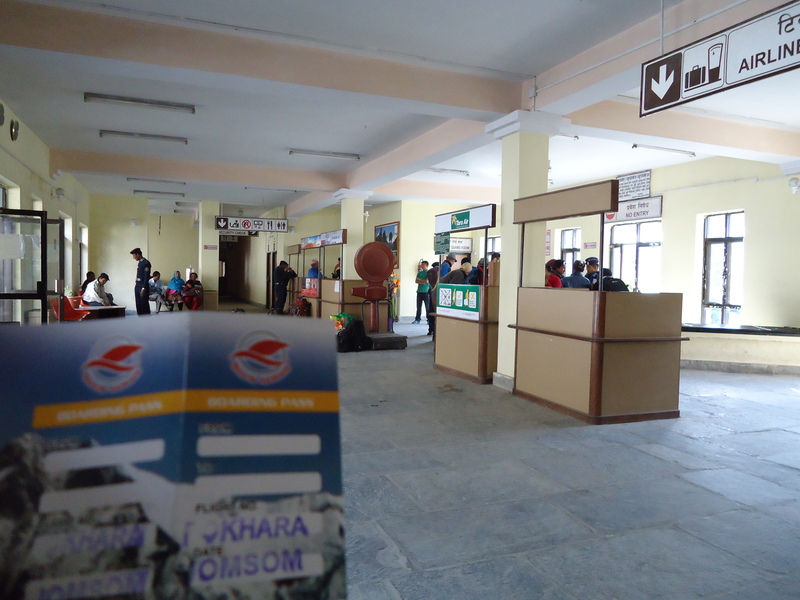 Each postcard was between 80 and 100 Nepali rupees (approx AUD$0.90 – $1.15). 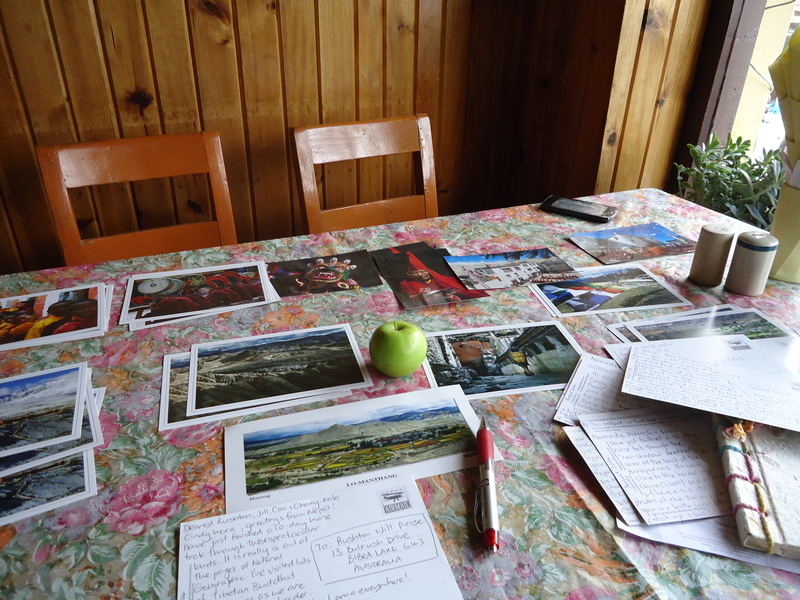 I had 44 people to write to, so I bought 50 postcards, which worked out to 4300 Nepali rupees. I didn’t have enough local currency, so I asked very politely if he would accept it in Australian Dollars. At the exchange rate, it worked out to almost exactly fifty Australian dollars. I pulled out a $50 note, handed it over and he looked at in wonderment. I thought perhaps it was because Australian banknotes are made of plastic (not paper) – this is the usual reaction from backpackers and travellers. Bear in mind that the average Nepali wage in the mountains is 300 rupees, or $3, per day. To put it in perspective, think about how much you earn in a fortnight. I had basically spent that amount … on postcards! “It’s not about the actual postcards. Imagine the postcards are free. What I’m really doing is making a $50 donation to the monastery. It’s a small amount considering how much it costs to maintain this 700 year old building. He seemed to really like the sound of this, and shook my hands warmly as we left. I decided to leave the writing for when I got back to Pokhara or Kathmandu. I didn’t want to miss any of my mountain experience thinking about others back home. Plenty of time for that in the city/town. 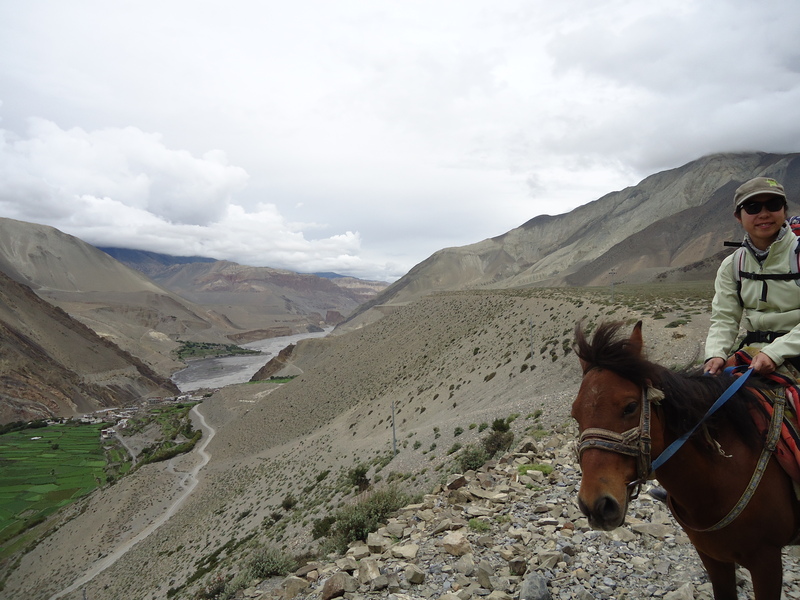 On the final day of the horse trek, we arrived in back at our starting point Jomsom, ready for the once-a-day 35-minute flight over the Annapurnas to return to the major city Pokhara. 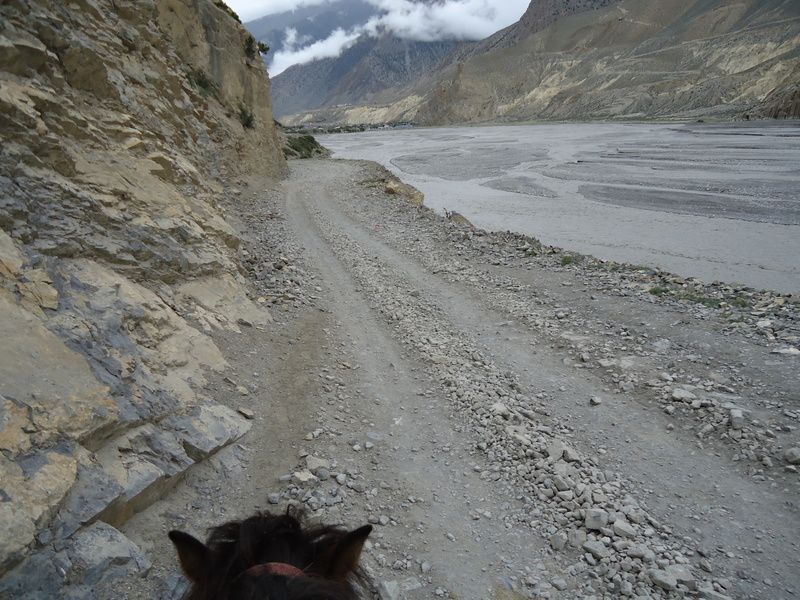 First glimpse of our last destination on the horse trek. It’s drizzling already and we’re riding into steadily worsening weather. I wanted one last photo of us all together. But it was cloudy, cold, windy and raining and we were at the end of 10 days on the trail. Not exactly smile central, although our hearts were happy! Then we received news that all flights had been cancelled for the previous three days and ours (scheduled for 6am, 15 August 2014) was also looking to be in the same proverbial boat. That night, the clouds rolled in and it rained … and rained … and rained … and rained. 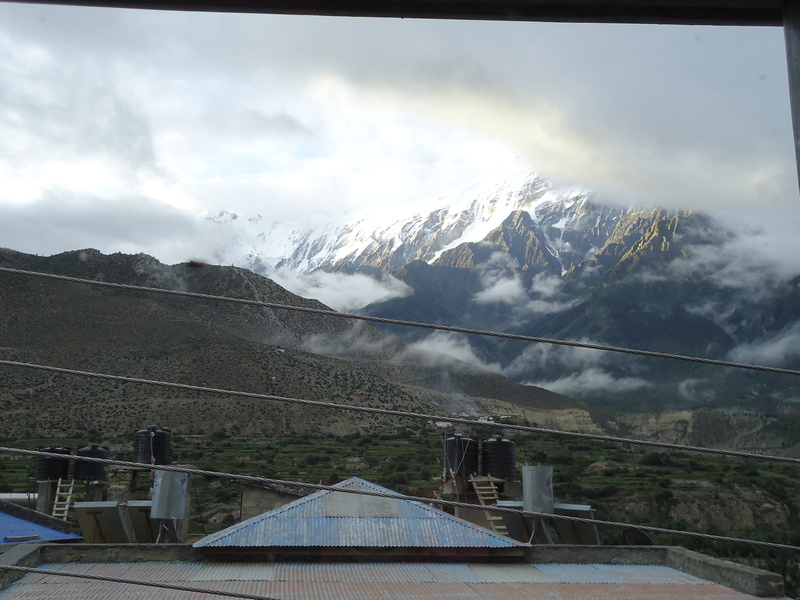 By 6:30am, 98% of the trekkers in town had elected to go back to Pokhara by bus and jeep through the mountains. With three landslides blocking the route, it was pitched as a gruelling 14 hour trip with 4 vehicle changes. I phoned my travel insurance company who said that I might have a case to claim the USD$2400 for a private helicopter because the cancelled flight was not my fault – as long as I could prove that the cost of a helicopter charter would be more economical than the cost of missing all my onward-booked accommodation, activities and flights plus the expenses incurred for extra nights in Jomsom. This was easy, as I was flying business class back to Australia. 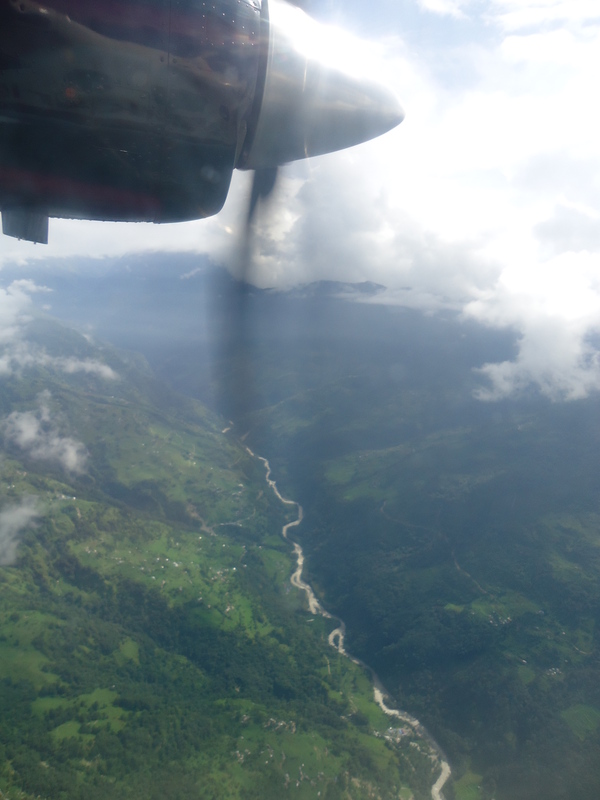 We booked a helicopter but had to remain on standby as the pilot could only fly during a break in the weather, and it needed to be clear enough for take-off in Pokhara, plus clear during flying through the Annapurnas, plus clear for landing in Jomsom. A difficult combination to get all at once with the weather constantly changing and turning that day. Unable to move too far away from mobile reception (in case the helicopter company phoned to say Get To The Airport), our activity options were limited. We couldn’t hire horses to go exploring, or visit a different town. The electricity load-shedding (scheduled rolling blackouts throughout the country) meant that there was no power at the hotel til around 6pm. Which meant no WiFi to keep us entertained. We went for walk around the town, which wasn’t hard to do with the town spanning approx 2 square kilometres. 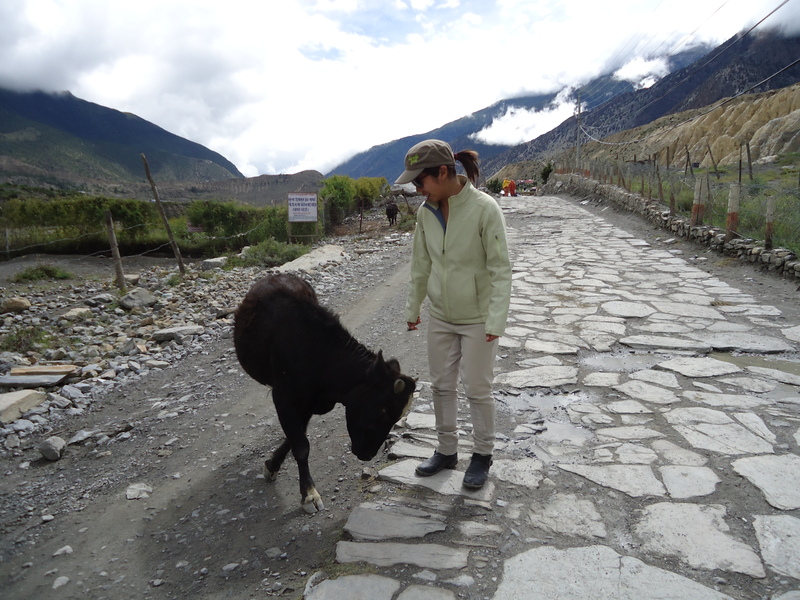 An eventful and memorable moment, when I wanted to capture how tiny the mountain cattle were, so I tried to pat a passing adult bull. He made it very clear he wasn’t a pet! After the walk we went back inside the hotel. 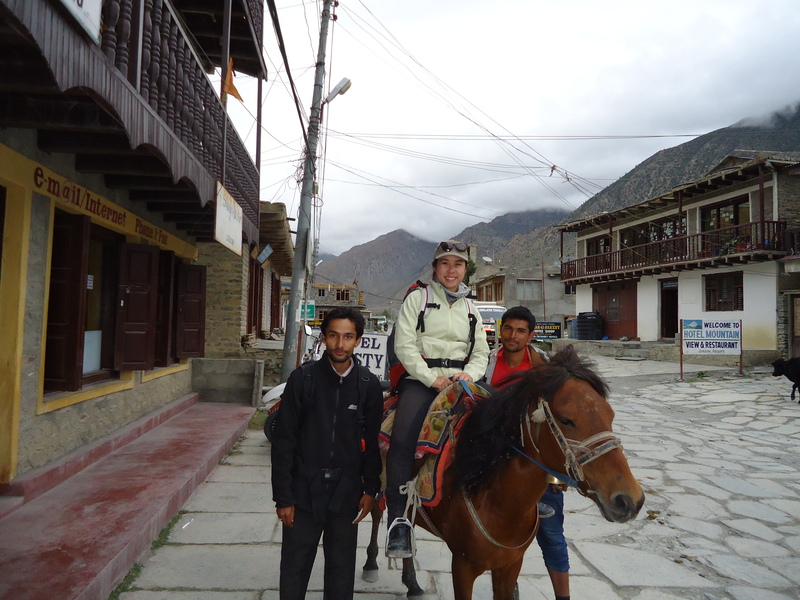 I hadn’t brought any books with me because horse trekking without porterage meant very limited cargo, so I’d left them all in Pokhara. Books or no books, I was just grateful that even though we were stuck, we were warm and dry. I had come prepared with lots of radio documentaries, so we listened to a few using the speaker on my phone. I tried to pick ones that Ashok might enjoy. One was about multiculturalism in Australia. The other was about the concept of karma and reincarnation in Tibetan Buddhism. In this doco, some Buddhists in Australia visit fishmarkets to buy live seafood with the intention of returning these tiny sentient beings to the ocean. In a flash of comedy gold, Ashok proposed that the fishermen would only have to follow their boat, and pick up the returned sea creatures, to sell in the fishmarket again to the Buddhists …. who would throw them back in the ocean … and follow their boat …. We laughed for long time about these poor lobsters, oysters, crabs and prawns. After this I needed something to do. So decided to write. I wrote 50 postcards! It was the perfect way to fill in the afternoon and evening hours. As you all probably know by now, I love writing. When the sun finally finished setting at 20:30, we knew that there would be no helicopter that day. But it was fun trying! The next morning dawned bright and clear and I saw Mt Nilgiri properly for the first time. We waited eagerly for the official word to say whether flights were on or not. 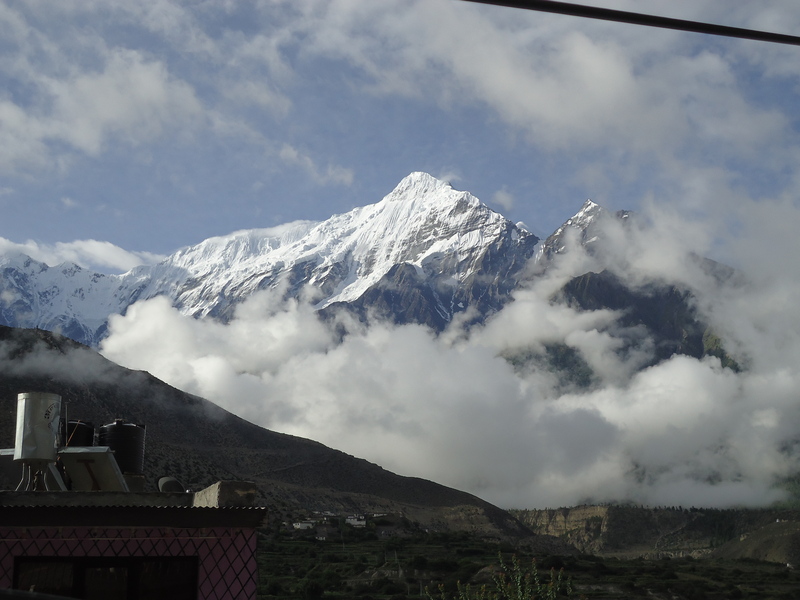 We hurried the 200 metres down the road to the airport, as the backlog of trekkers, their guides and a few locals descended on tiny Jomsom Airport. Foreigners were prioritised to be bundled onto the first flight. 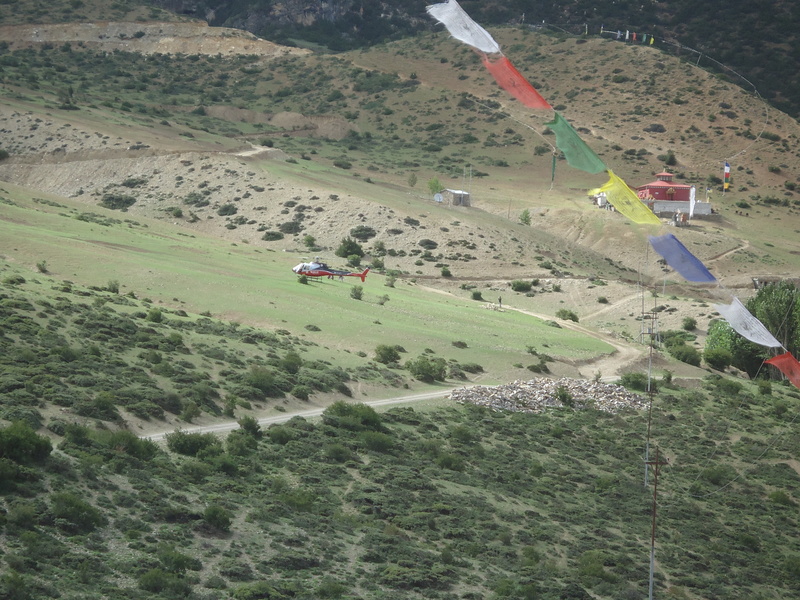 All locals were hoping that the weather would hold good enough for a second flight so they could get off the mountain too. I was so excited I didn’t even notice they had stamped my boarding pass with the destinations around the wrong way. Excitement slowly gave way to some sadness, when I realised that the plane I’d been looking forward to seeing for 48 hours, was also going to take me away from my beloved mountains. The mountains felt like home. It was definitely mixed feelings. Part of me wanted the weather to turn so the plane couldn’t take off. To describe the flight in a tiny plane over the biggest mountains on the entire Earth as spectacular really doesn’t do it justice. 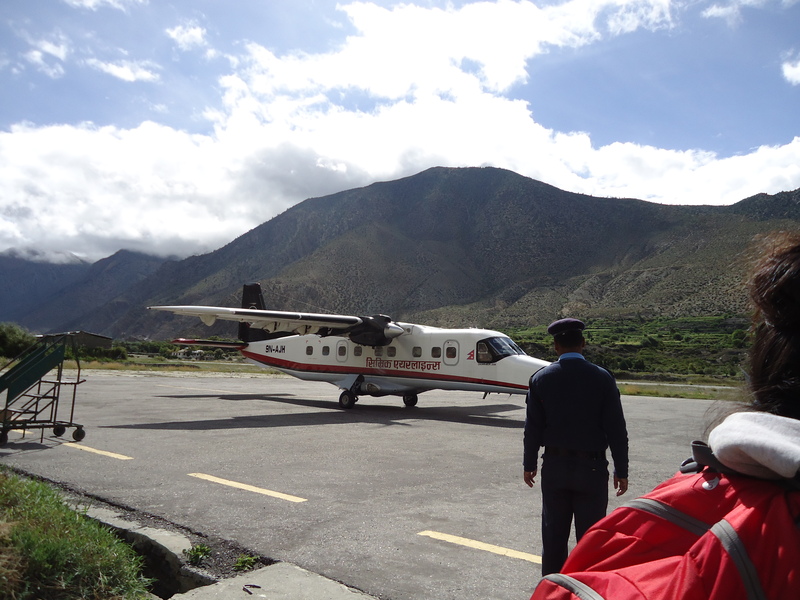 I never felt unsafe, but as you can see the plane was so small we were flying very close to the mountains. I could see flocks of goats, Jeeps wending along rutted roads and smoke from chimneys. It is a very real experience! Much better than any view from a Boeing or Airbus. 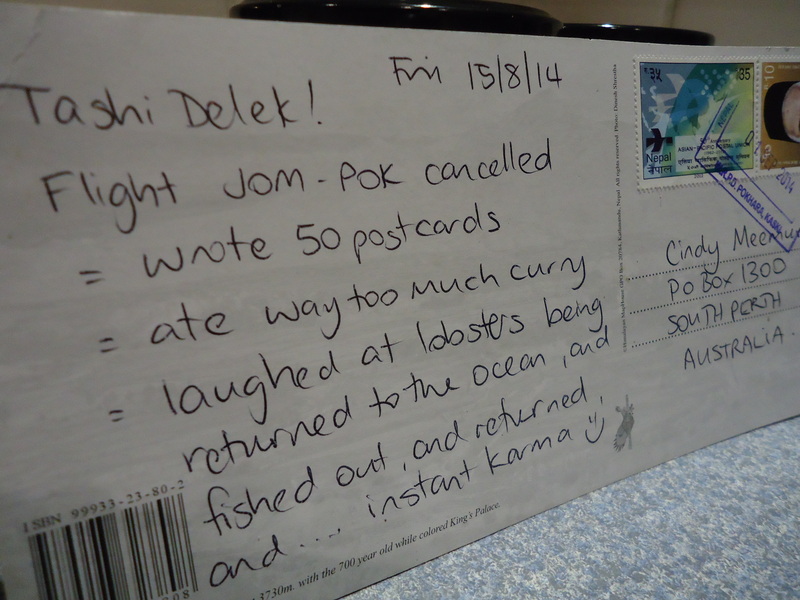 The postcards made it into a post-box in Pokhara the following day (16 August 2014) and arrived in Perth on 22 September 2014. Burn the brightest you can, while you can. Cool story! Nepal is such a special place. So no helicopter? Thank you Stephen. Plenty more stories to come! 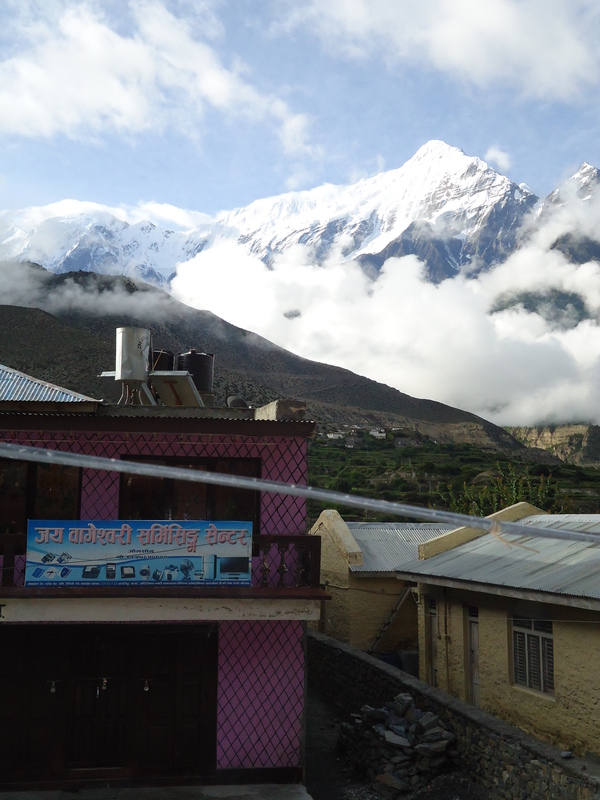 Reblogged this on Eco Holiday Asia | Eco Tourism in Nepal | S Nepal Tours & Travels. Great travel story Cindy and awesome memories to have of such a special place. Stunning story and country. You are a true adventurer! This is not a game of Who The Fk Are You? Is this the Best Value Sandwich in North Island, New Zealand?